Outdoor shoes with velcro strap fastening. Genuine leather & Vibram® rubber sole. Sole: 5mm light flat Vibram® sole is stitched to the leather. Vibram® are leaders in manufacturing of soles and sole materials.The Vibram® rubber has excellent non-slip characteristics, flexibility and elasticity. The softness of the sole provides a maximal barefoot feeling and acts as a natural shock absorber. Thus the sole stimulates the foot receptors and helps the foot development. Insole: If you would like to order wool/leather insole, please go to this product. Our shoes gratify the needs of the grown baby feet making their first steps. Toddler shoes must not limit the free movements of the growing feet, nor deform, press on and constrict them. Your child can wear the shoes with or without socks. 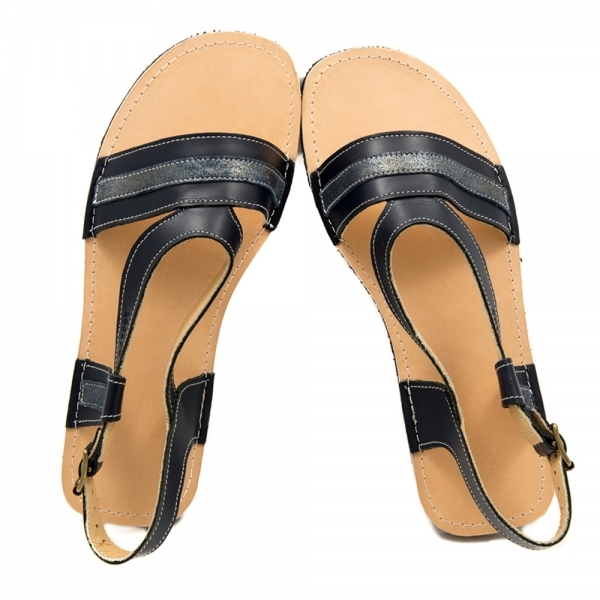 The air circulation is very good due the breathability of the 100% natural leather. The inner dimensions of this model are described in the table below.The feet length should fall within the range in column "RECOMMENDED FEET LENGTH". The maximal circumference around the widest part of the toes should be equal to the numbers written for each size in column "MAXIMUM CIRCUMFERENCE (TOES)". We can customize the width of the front leather part (+/- 1 cm) which is currently made by hand. The charge for making the shoes narrow is €5 and and €7 for wide shoes. You can add the extra fee here. % lining leather, formaldehyde and azo dyes free. Sole: Light flat Vibram® sole is stitched to the leather. The sole features tremendous flexibility and elasticity, and wearing it stimulates the foot receptors and helps the foot development. The Vibram® rubber has excellent non-slip characteristics. Appropriate for outdoor use -> long-long lasting walking and playing outdoors, especially for toddlers, making their first steps. Our shoes gratify the needs of the grown baby feet making their first steps. They are designed for toddlers - the flexible sole and shoe construction are engineered to render a barefoot feeling as close as possible. Toddler shoes must not limit the free movements of the growing feet, nor deform, press on and constrict them.